Attero Tech’s VoiceBox 4I/OP facilitates two-way communication between the press box and drivers by converting the analog inputs from the mics to digital signals that are sent across a CobraNet network in real time. 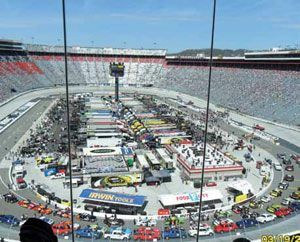 BRISTOL, TN—In 2010 the Bristol Motor Speedway decided to remodel the infield and along with it the AV system. It was against this backdrop of aural overdrive that Danny Walker and Josh Thompson of Point Source had to develop an AV plan that would accommodate its current and future audio needs. But it would take more than brute force to tame Bristol. There were cost constraints and the need to integrate the new gear with existing equipment. Furthermore, the retrofit of the entire speedway AV system would have to take place over a period of years—with the first phrase occurring within a 60-day window— so the new system would need to accommodate changes in technology. Reliability trumped all other concerns. “There are about 40 million people around the world watching and listening to this race,” Thompson said. “So we live in a no-fail environment.” Point Source also had to take into account the harsh environments around the track. With a dozen locations for processing voice inputs from Lectrosonics, Sennheiser, and Shure mics, a conventional analog approach would require miles of shielded-copper cable to achieve the network necessary to relay audio information to the appropriate end points. There would also be the considerable installation cost for running all that wire. So Point Source quickly dismissed the traditional patchwork, private-network approach. They decided on a networked audio solution that runs on ethernet, which can carry up to 64 channels of audio on a single line. They could also integrate it with the existing single-mode fiber used for television feeds to the media. Point Source overcame line noise and signal degradation over the track’s great distances by using Whirlwind equipment to distribute CobraNet over single-mode fiber. Point Source has been using CobraNet since 1999. While CobraNet meant a less costly installation, they still had to look for more ways to economize. Point Source turned to a CobraNet-enabled device ideal for the scale of this installation. Its big advantage: it was available at a third of the cost of the rack-mounted alternative. Called VoiceBox 4I/OP from Attero Tech, this CobraNet Audio Interface is a four-in/four-out mic/line preamp that features four balanced inputs, with both gain and +12V phantom power selectable on a per-channel basis, and four line-level balanced outputs. A RS-232 serial bridge port enables the transmission of serial data from any VoiceBox to any other CobraNet device supporting a serial bridge connection on a CobraNet system. Additionally, the VoiceBox relies on a passive cooling system so there are no contaminants introduced by a fan. The main PA cluster atop the center pylon features 10 Community M-4 horns, 10 JBL two-inch compression drivers, and 18 custom double cabinets powered by Lab.gruppen amps. Point Source created a local area network (LAN) for the project. It was a new buildout that included fiber optic transceivers, fiber optic cable, Cat-5 cable, and gigabit ethernet. They can access the LAN anywhere at the raceway by simply plugging a Cat-5 cable from the network into a laptop that’s equipped with the Attero Tech Control Center configuration and monitoring software interface. As well as configuring the generic parameters of any CobraNet device, Control Center also includes device-specific setup for Attero Tech products such as the VoiceBox 4I/OP. The Bristol Media Center is located in turn four and houses a pressroom in the basement. Driver interviews are mixed here and put on the network. The VoiceBox facilitates the twoway, back-and-forth between the press and the drivers by converting the analog inputs from the mics to digital signals that are sent across the network in real time. Meanwhile, out in the race area, the center pylon serves as the primary PA. Lab.gruppen amplifiers power 10 Community M-4 horns, 10 JBL two-inch compression drivers 24/45, and 18 custom double cabinets. Point Source replaced older style paging horns under the suites to supplement the main stack. “People underneath are blocked from hearing main cluster,” Walker explained. With the software, Walker and Thompson can make EQ , compression, and gain adjustments to the system in real time. If the amp overheats, for example, they can adjust it so it doesn’t go into thermal through the BSS London unit, the main brain of the system. Point Source estimates that the networked AV approach they employed resulted in a 50 percent cost reduction in audio transport infrastructure. By eliminating miles of shielded copper cable, the company also reduced installation labor by weeks and hundreds of man hours. “When you consider all the trenching, conduit, and wire pulling we avoided with networked audio, we’d never use anything else,” Walker said. Chris Lord is product support engineer for Attero Tech.